Marta Kamen spies on a Lukrum drilling site. Tonight's (Nov. 26) episode of National Geographic's "Mars" showcases the great lengths that scientists will go to in order to answer some of life's most difficult questions. 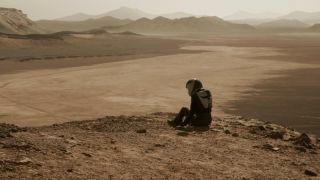 "Mars," a docudrama that combines a dramatic storyline with real-world documentary-style interviews with experts, premiered in 2016. The series initially followed the first humans to land on the Martian surface. Now, the series' second season dives even deeper into the complex issues that arise on Mars and how they parallel concerns here on Earth. The first two episodes of Season 2 grappled with the tensions between private and government space enterprise and whether we will treat Mars like we treat Earth. The season has also explored how life on Mars will affect people's relationships and mental health. Kamen's struggle with Lukrum and her dedication to research is paralleled in Episode 3 by real-life scientists researching the Greenland ice sheet. This expansive body of ice is a harsh environment for humans, as glaciologist Jason Gulley demonstrates in the episode. He and others spend months out of every year essentially stranded in remote areas and extreme conditions, working until the helicopter that will take them out arrives. Gulley and his team endure severe temperatures and the threat of losing their way our on the ice sheet. Freezing rivers threaten to whisk them away as the elements relentlessly berate their senses. But, as the ice sheet continues to melt at startling rates, studying the area contributes greatly to our understanding of climate change and how sea levels might rise. In addition to braving the elements, scientists on Earth as well as the fictional scientists in Olympus Town face opposition and skepticism from the government and the public. In Olympus Town, Kamen is at odds with the IMSF (International Mars Science Foundation), an Earth-based agency that governs the residents of Olympus Town. She is afraid that Lukrum will contaminate Martian samples that could hold new strains of life, but the IMSF doesn't want her to get involved with Lukrum's operations. Here on Earth, scientists studying climate change, like those studying the Greenland ice sheet and ice in the Arctic, face constant opposition. Personal opinions contradict scientific fact in both the government and the public, so scientists like those pushing climate science forward have to really fight for their work. This struggle is showcased in gripping detail in this third episode. Javier and Amelie, settlers in Olympus Town, embrace. Romantic relationships can get complicated on Mars. The episode also continues to highlight the psychological toll that living on another planet might take. From settlers dealing with grief to Commander Seung's tendency to hide her emotions to maintain authority to the intricate and ever-changing nature of romantic relationships, life on the Red Planet is complicated. Scientists are working to understand how such a trip might affect astronaut mental health. From the long-duration trip to get to Mars to actually living on an alien planet you might never leave, the journey will be wrought with isolation and difficulty. But, hopefully, with ongoing efforts to understand these effects, future astronauts will be prepared for such hardships. "Mars" airs Mondays at 9 p.m. EST/8 p.m. CST.